Image caption Chan fhacas Robin Garton bhon 25mh den t-Sultain. Thèid buill de Sgioba-teasairginn Beinne Ghlinne Comhann a-mach a-rithist air an deireadh-sheachdain a choimhead airson fear-coiseachd a chaidh a dhìth bho chionn mìos. 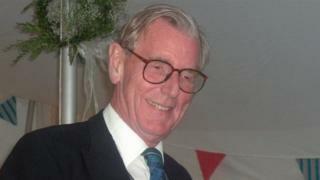 Cha deach Robin Garton, 69 à Devizes, Wiltshire, fhaicinn bhon 25mh den t-Sultain. Chaidh e a dhìth is e air turas coiseachd air Ghàidhealtachd. Bha iomairt theasairginn mhòr a' dol an Gleann Comhann bhon uair sin, le heileacoptairean, sgiobannan teasairginn agus coin. Rinn dàibhearan sgrùdadh ann an Abhainn Comhann cuideachd. Bha Mgr Garton uair ag obair na fhear-reic ealain agus stèidhich e carthannas atharrachadh sìde. Chaidh aithris gu bheil e 6' 2" de dh'àirde le falt bàn a tha a' tanachadh. Bidh speuclairean air aig amannan.